This “Big Three” may not be anything like Arnold Palmer, Jack Nicklaus and Gary Player, but we feel we can make a positive impact on golf — especially in the Chicago area. We are three golf reporters with a combined 102 years of experience covering the sport we love. We’re kicking off 2012 by announcing an affiliation agreement in which we’ll spotlight the lead stories on each other’s websites. We see this as a means of staying ahead of the rapidly changing media changes within the golf industry. While there will inevitably some overlap in the subjects we cover, our websites are each a bit different. Rory Spears (www.golfersongolf.com), the best golfer in our trio, is a rater for GolfWeek magazine. He’s worked in a variety of positions during his 27 years in the golf industry. In addition to writing The Gog Blog, he is co-host of Golfers on Golf which is in its 10 season as Chicago’s longest-running golf radio show. Tim Cronin, for 33 years the golf writer and columnist for the Daily Southtown/Star, has established himself as the premier Chicago golf historian. He’s written four books on the histories of Chicago clubs. He’ll be offering his unique perspectives on the golf news of the day on his website, www.illinoisgolfer.net. 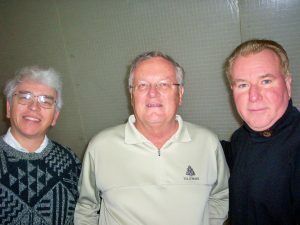 My lenziehmongolf.com will continue to focus on golf travel destinations and tournament reports. If one of us doesn’t provide what you’re looking for, chances are good that one of the other two will. The affiliations with Rory and Tim means that Len Ziehm on Golf is now connected with three other websites. We earlier reached agreement with Cheryl Justak’s “Golf Now! Chicago,’’ the premier travel destination guide. My travel stories will run on her www.golfnowchicago.com.